Even during his own day, no politician would have supposed that Mr. Twain’s humorous exaggerations were to be taken as scientific theorems. It is bad taste to take laugh lines seriously. Laughter is the proper response to a laugh line. On the other hand, comedy conceals the dragon’s fangs because all exaggeration is an elaboration of a hidden but widely acknowledged truth, which is why the good laugh line stings. Congressmen do sometimes appear to be idiotic, and legislators in session do concern themselves with the acquisition of taxes – money is property – and personal liberty is abbreviated by excessive regulation. One can only imagine what comic use Mr. Twain might have made of Bridgeport – or Hartford, where all the “idiots” meet to plot ways of wresting dollars from taxpayers. Fortunately for Ms. DiNardo and the Democrats, the unintended consequences of the state mandated minimum wage – which fall most heavily on poor African American boys – will not be felt until long after the upcoming elections are put to bed. No one expects the Democratic hegemony in the state’s larger cities to wither away any time soon. Connecticut’s cities have been Democratic fiefdoms for decades. In Connecticut’s one-party towns, the Hobbesian vision of life – nasty, brutal and short – is all too familiar, but not to people who live in Fairfield’s suburbs, where Mr. Foley safely cracked his joke. Fewer jobs in the cities, more fatherless households, a state government that winks at murders committed with illegally acquired assault weapons; none of this is likely to render urban life less nasty, brutal and short. In New Haven, Democrats recently elected as Mayor a candidate whose late husband had been the city’s most conspicuous tax scofflaw. Mayor Toni Harp, following her election, vowed to balance the city’s budget by raising taxes 3.8 percent. No one laughed. In Bridgeport, long under the thumb of Democratic power brokers, former state senator and felon Ernie Newton, appears poised once againto run for the General Assembly seat he was forced to relinquish before he went to prison. Mr. Newton is a Big Tent Democrat. "Our tent has to be big enough for everybody," Newton said recently. "Do you realize half the folks voting Democrat in Bridgeport could be ex-felons? So they're looking at a voice (for their needs)." No one laughed because Mr. Newton was not joking – and Mrs. DiNardo zipped her lips. The difference between Mr. Foley’s remark and Mr. Newton’s is the difference between lightheartedness and lightheadedness. One was joking, the other was serious – and serious in a way that throws a searching light on the real danger of the one-party state, which is not so much incompetent as it is omni-incompetent. In a strong two party city, citizens may escape their discomfort through rational voting. In the one-party state or city, choices are made for them by lightheaded politicians, the sort of people against whom Mr. 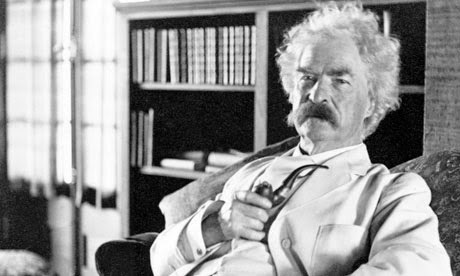 Twain directed his pen, which he claimed to have been dipped in the fires of Hell. Surely, there is plenty to laugh at in the political apparatus in Bridgeport or in Hartford. Yet, even though my sense is that these municipal governments are more ridiculous than ever, I don't find them as humorous. It's easier to laugh at the corruption in cities that the Democratic Party has not succeeded in utterly destroying; e.g., Chicago v. Detroit. Bridgeport and Hartford are simply pathetic. The problem is not so much that there is only one political party in Bridgeport, its the particular political party. And, even the Democratic Party is capable of less corruption in less urban zones. The ultimate problem is that we, the Nutmeg Staters, have effectively engineered the middle class out of our cities. Those people who remain are omni-incompetent, and view themselves as perpetual beneficiaries of government care and largesse. Their primary concern is not with the duties of citizenship or of public office, and therefor corruption is not intolerably offensive. "The contagious people of Washington have stood firm against diversity during this long period of increment weather." During one of his campaigns Curley promised he would get all the Irish washer women off their knees. Following his election victory, he bought them all long handled mops. The national government has put on a great blitz in the past five years, but it has not yet achieved comprehensive destruction. Like with Chicago or Manhattan, there's still an edifice we can point at and call the United States. So, while Baraq Obama and Eric Holder are doing their best at institutionalizing corruption of the Constitution and the rule of law, we can still find a lot of humor in the situation. We certainly wish that H.L.Mencken were around to provide commentary on the reigning mountebanks and buffoons.